The aim of journal is to publish research articles that are related to social sciences. It invites high quality studies in the fields of economics, commerce, management, public administration, political science, education, sports, public finance, business administration, and business law. It welcomes studies that are written other researchers and practitioners. It welcomes papers from both academicians and practitioners on conceptual paradigms, academic research, theories, business models, as well as organizational practices in humanities and social science. The goal of journal is to constitute a qualified and continual platform for sharing studies of academicians, researchers and practitioners. The journal welcomes manuscript submissions from scholars everywhere. IJMFSMR aims at promoting and disseminating relevant, high quality research in the field of Financial Services & Management Research management. It is a double blind reviewed refereed academic monthly journal, publishing research articles in the field of marketing, banking, finance, insurance, stock market, commodity market, portfolio management, business economics, human resource management, and allied areas of management research. The journal endeavors to provide forums for academicians and practitioners who are interested in the discussion of current, future issues and challenges. The journal welcomes manuscript submissions from scholars, academicians and practitioners. 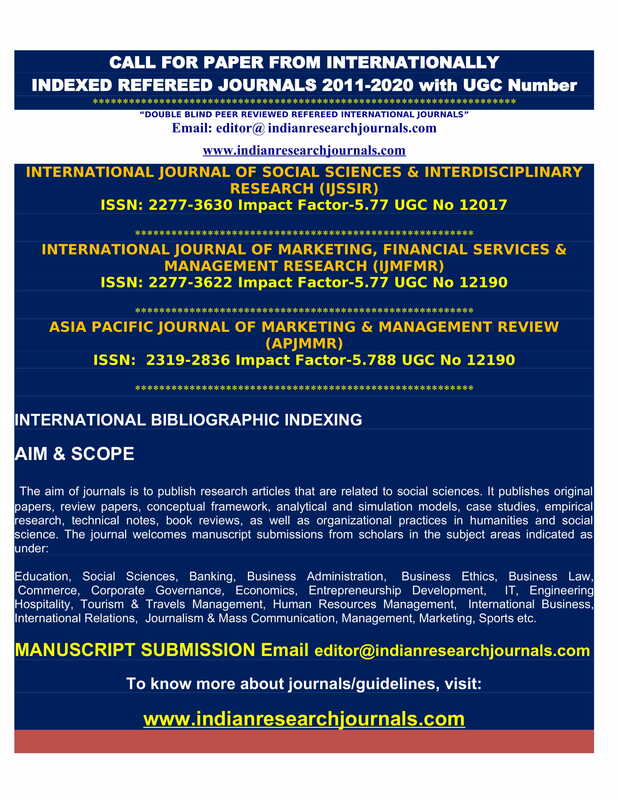 The aim of journal is to publish quality research articles in the fields of marketing and allied areas of management. It welcomes papers from both academicians and practitioners on conceptual paradigms, academic research, theories, business models, as well as organizational practices in marketing and management research. The goal of journal is to constitute a qualified and continual platform for sharing studies of academicians, researchers and practitioners. The journal welcomes manuscript submissions from scholars everywhere.